When we had Crystabel, I started our breastfeeding journey within the next hour of her birth. As I had not been reading or browsing the online groups that extensively back then, it never occured to me that some mums might have a hard time latching on or keeping up with their little one’s milk intake. Fast forward 4.5 years later, I am now back on that same precious journey with Callum. My worry that I would not have milk immediately after birth this time round (as I delivered via c-sect) was unnecessary, as the milk kicked in by the 3rd day. Again, I was producing more than what was needed and had to start pumping from day 3 onwards. My oversupply problem was bigger this time, and I had to regularly donate my excess breastmilk to another mummy who is facing low milk supply issues. Yes, this might be a happy ‘problem’ but this time I felt that breastfeeding was much harder compared to the first time. I attribute this to the fact that age is catching up which leaves me mentally and physically drained with the marathon of pumping and latching sessions. Besides that, all the washing up of pump parts and bottles all on my own was exhausting – and there were days when I felt that the support I needed from those around me was not available. This has led to a case of mild postnatal depression during my maternity leave, but thankfully I managed to snap out of it and persevere with my breastfeeding journey. I do not know if I am able to breastfeed Callum for as long as I did with Crystabel, but I will try my best and take things one day at a time. 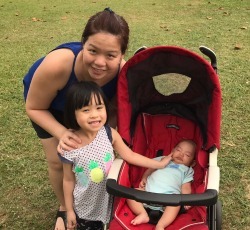 Both breastfeeding journeys were precious to me in their own way, and I was looking for some way to preserve the memory so that I can always look back at the early days, years from now when they are all grown up. I also want something physical to make reference to as I tell them about my journey with both of them when they were babies, and to encourage them to go on that same path I did (or in the case of Callum, to be supportive of that journey). The Baby Feet Glass Locket, as seen on the Keepsake by Ryo website. I heard about breastmilk jewellery (i.e. necklaces, pendants, lockets, bracelets) being discussed on the mummy groups and found this concept rather interesting. It’s amazing how it is possible to use our precious liquid gold to make these jewellery pieces – and that these pieces will be preserved forever. Upon searching for reviews on vendors which do breastmilk keepsakes, I settled with Keepsake by Ryo. The materials used to produce the keepsakes seem to be a better quality, and there were so many options of keepsakes to choose from. In fact, choosing the type of keepsake to get done was the hardest part – they were all so pretty that I want them all! After a lot of thinking and browsing on their website, I finally decided on the “Baby Feet and Name Glass Locket”. I fell in love with those cute baby feet and how I could put the names of both my babies on the locket. I started off by filling in the order form for the glass locket. Everything was relatively simple, but when it got to the field for the name, the total character count for both my kids’ names exceeded the recommended limit. I quickly sent in an email to ask for advice on how to proceed with the order. The person who attended to my case was very patient and advised me to submit the order through another product type which allowed longer character count. From there, they will take note of the preferences of my design (i.e. font type, colour and detail of the baby feet design, and the names to be included). For each order, we need to send in 20ml of our breastmilk. This should be thawed (not frozen, so that it does not stain the other packages while in transit) and kept in a storage bag. For good measure, it may be a good idea to place this into a separate ziplock bag to prevent spills. You can opt to send this in via registered post to the address given, or go for their Smartpac inclusion collection service. A Smartpac envelope will be sent to your address together with a system generated order form enclosed – this helps to ensure that there is absolutely no chance of inclusion mix-up. Place your inclusion into the envelope, seal it and drop it off at any Singpost post box or post office. All Smartpacs will be labelled with Keepsake by Ryo’s delivery address. No stamps are required, as postage is pre-paid. Singpost will deliver the package to Keepsake By Ryo’s address and you are able to track the delivery progress online. Do note that Keepsake by Ryo dispatches their Smartpacs every Tuesday, so do allow 3 to 4 working days for it to reach you. Once all of the above is done, all you need to do is to wait for your order to be created, completed and sent to you via Smartpac. According to their website, the usual waiting period ranges from 2 to 14 weeks from the receipt of your milk. I waited for about 4 weeks for mine to be completed and posted to me, which was reasonable – after all, good things take time. The breastmilk locket came to me in a sleek white box – just like real jewellery. There will be a small piece of cloth provided together with your keepsake. This cloth is made from high quality cotton that is coated with jeweller’s wax – do use this to gently rub the precious metal parts so as to maintain the shine. The cloth should never be washed or bleached in order to maintain that layer of wax which will help in polishing your keepsake. Your keepsake should be kept dry at all times, and if it is used frequently, it should be kept away from excessive exposure to air by storing it in the jewellery box with silica gel. Note – Your handmade breastmilk keepsake comes with a one-year warranty to cover you for any discolouration of breastmilk components. Check out more tips on the order process and caring your your keepsake here. Want to preserve the memories of your breastfeeding journey? Get in touch with the lovely team behind Keepsake by Ryo and place your order now! Next Next post: Breastfeeding Achievement Unlocked: Making It to the First Year!